If you have Bitcoins, you can now get a full year VIP membership to BlueBlood.com and all the membership sites under the Blue Blood umbrella. The price is just one Bitcoin and the first hundred people to sign up during this promotion will also get a free Blue Blood T-shirt commemorating the Bitcoin early adoption. You can also choose to be 100% anonymous when you purchase a membership via Bitcoin. The only things you need are a Bitcoin wallet and an email address for password confirmation. Yes, BlueBlood.com is the first adult site to accept Bitcoin for memberships. If you read BlueBlood.net, you probably know that any technology adopted by adult is likely to be a winner. Remember Betamax versus VHS? Guess which one made itself available for adult content distro. The winning one, that’s which one. I just took this class on macroeconomics. And it had a unit on the issues created by the US dollar being the world’s reserve currency. The class included treatises by a couple of economists who would like to see the International Monetary Fund’s SDR Special Drawing Rights unit used for more things. (This might be Nobel Laureate speak for eff the dollar.) The SDR is based on an unevenly weighted combination of values of a bunch of currencies the IMF feels are important. I got all intrigued by the concept and got all into studying alternative currencies. The one which I find the most fascinating is the Bitcoin crypto-currency, BTC for short like $ is for dollar. Basically, rather than being a piece of paper or bank ledger which a government or international agency determines by fiat to be money, Bitcoin is essentially a peer-to-peer decentralized system of code as money. I am really excited about BlueBlood.com accepting BTC for membership. I’m fascinated by the apolitical technological genesis of Bitcoin and, from the cantina scene in Star Wars to the brand name future of Neuromancer, I’m inspired by the possible and excited by innovation. The desktop publishing revolution powered Blue Blood in print and this internet thing has worked out pretty good for Blue Blood. Now the idea of being able to divorce the notion of money from any specific sovereignty is just really interesting to me. The endemic problem with being all punk rock and bohemian is that it is difficult to gain the power to enact good social change, if you are hostile to money. I look forward to seeing how the cypherpunk answer to this impacts the world. Anyway, before I wax too wonktastic, the important news here is that BlueBlood.com just became the first adult site to accept Bitcoin crypto-currency as payment for memberships. 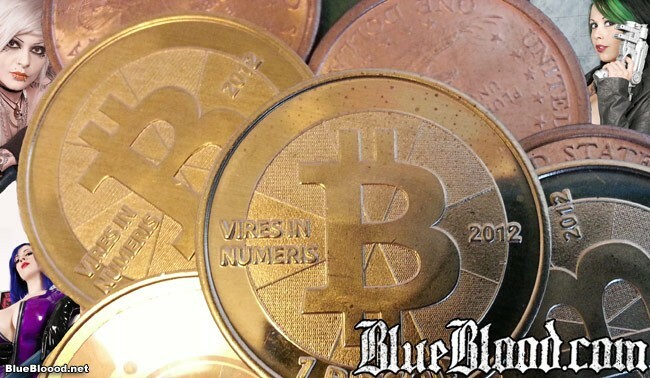 One single Bitcoin gets a full year counterculture erotica mega-pass membership to BlueBlood.com and all its associated sites, celebrating the best in iconoclast sensuality. In addition to thousands of photo sets of gorgeous gothic girls, mohawked punk beauties, tattooed cuties, and latex fashionistas, the mega-pass gives access to vampire and science fiction cosplay shoots, high quality fiction authored by big name genre authors, and of course Blue Blood’s world famous signature real life counterculture couples shoots. Plus you get an awesome T-shirt, if you are one of the first 100 people to use Bitcoin during this promotion.